This is my first year ever to really cook a Thanksgiving dinner, which we’re taking to my boyfriend’s parents’ house tomorrow. We were originally going to have them over, but as our apartment building nightmare isn’t quite over yet, I’m still not comfortable with guests at our place. This is the result of one of those awkward “I’m a vegetarian and can’t do that thing you do every year, can we please do something else?” moments with Reed’s parents. They traditionally drive out to Salado to eat at the Stage Coach Inn, which cooks a “traditional” meal that basically consists of meat and chicken stock. Thankfully, they’re very accommodating and sweet. And I get to cook, which is almost always happy making. 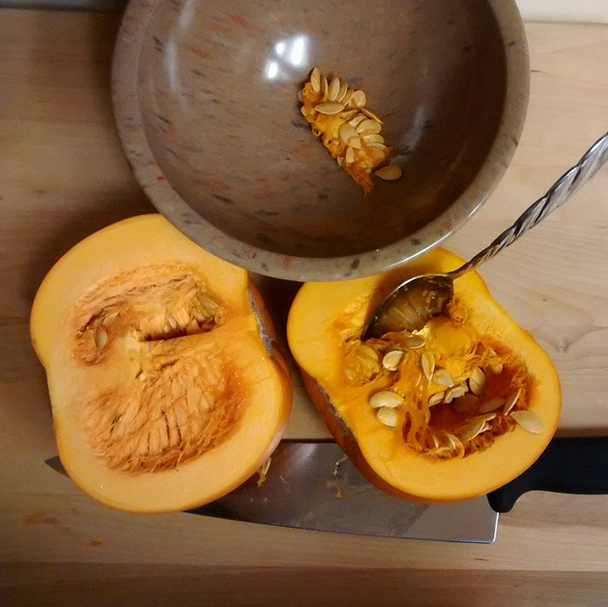 Having said that, I’l like to point out that cutting up a pumpkin for roasting is a seriously frustrating experience. Despite that, Phase I of Thanksgiving cooking was completed last night around 2am, against all sense and reason, and Reed now is home from work guarding a fridge full of pumpkin pot pie filling, roasted sweet potatoes and apples, and the supplies for Phase II; balsamic roasted brussel sprouts, pie crust, and a second round of pumpkin bread. He’s home from work with our brand new Wii U, and I am so jealous. The dark chocolate pumpkin bread I baked last night has been nearly half eaten. Word is quickly spreading around the office, especially among departments I used to belong to, that the time has come and the bread is finally here. I’m looking forward to the long weekend. A day with family, an evening with friends, seeing a movie with a dear friend of ours on Friday, and then we’re going to Celtic Christmas at the Texas Renaissance Festival on Sunday. Of course I’ll try not to feel guilty about not spending the extra two days on our big Rearrange the Whole Damn House project. I’m a little nervous that I may cave in and go on a big trip to Ikea on Saturday, as our grand plan requires buying several new bookcases. Most importantly, I don’t have to look at a single spreadsheet for four whole days! Lazy Video Post: When is Thanksgiving? An unseasonal frozen hell approaches North America. Do you fear what I fear? To some people, the colder months mean a time of family and celebration, feasting and joy. Some of us, however, know the horrible truth. Winter is a time of demons, of death, of confronting natural forces that can lay waste to entire civilizations, through starvation, disease, and madness. We take comfort in the gatherings, and we are deeply grateful for the feasting, but at the bottom of our shadowed hearts is the understanding that we gather because there is strength in numbers. If the day finally comes that the screaming winds of winter shatter out of a darker dimension into some shambling monstrosity looking for a hearty, well fattened meal, pray that you are not alone in the cold. Pray that in your lifetime the stars will never be right. I have great respect for the H. P. Lovecraft Historical Society, and I encourage everyone to invest in their wondrously terrifying holiday albums.